Performers include: Jeff Werber and Lassie. 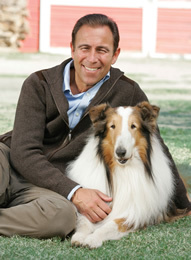 A “How-to” pet care TV show that’s co-hosted by the world’s most famous dog, Lassie, and celebrity veterinarian Dr. Jeff Werber. Today, pets are like members of our family and this series seeks to explore the emotional bond between domestic animals and their owners. In each installment, Lassie and her personal vet present a variety of segments that focus on pet health, pet lifestyle, and the pet community. There are also regular on-location stories as well as “Lassie’s PetVet Tips” that cover every day helpful information on topics like travelling with your four-legged friend, pet grooming, and even little-known trivia. Officer Donavan Jones from California’s Pasadena Police Department has a special best friend and partner on the job — a Belgium Malinois attack dog named Bruno. The show follows this unique team through a normal day at the department, off-duty at home, and while training. In the “My Pet, My Pal” segment, we meet Jill and Picazzo. While vacationing in Mexico, Jill kept bumping into a stray Dalmation. After he finally ended up following her car one day, she decided to adopt him and name him Picazzo. Unfortunately, he was later stolen. Jill spent months searching for Picazzo in Mexico to no avail. She finally decided to take a chance and hired a psychic to help find her beloved dog. Unbelieveble as it may seem, the psychic was able to help bring this owner and dog back together. In another segment, the game of flyball is profiled. It’s ideal for workdogs who need more than just regular play to fufill them. Flyball races match two teams of four dogs each that race side-by-side over a 51 foot long course. Each canine races in relay fashion down the jumps, trigger a flyball box, releasing the ball, retrieve the ball, and return over the jumps. The next dog is released to run the course but can’t cross the start/finish line until the previous dog has returned over all 4 jumps and reached the start/finish line. The first team to have all 4 dogs finish the course without error wins the heat. First aired: October 12, 2007. There’s been no news of plans to revive the show. Can you provide a list of foods that are toxic to dogs? ( chocolate, raisins etc. ) If I have acid indigestion I eat a couple of Tums. If my dog has acid indigestion what could I give her to make her feel more comfortable?? Can someone please tell me how I can purchase a copy of Episode 13. My dog and I are in this edition and I have tried for years to obtain it. Has this program been recorded on a DVD? If so, how could I go about getting a copy. I have been watching this series on KLCS for about a year and was very disappointed that this show was cancelled. It is a great show and it has added information I need to make my pet feel more loved and better cared for. Thanks for being on a station I watch. i ve been watching your show and have not seen anything on blind dogs. i have a blind and deaf boxer, was not born that way. She s a sweet and loverable dog, i dont no how to work with her. dont have the money to send her to training. Please help me. Give me some ideas on what to do. Thanks in advance for your information. With all the crap on T.V. these days why would anyone cancell Lassie and Dr. Jeff? please bring this awesome show back! Lets get Lassies Pet Vet back On TV. It’s better than Letterman !! I have watched your program on UBC by the animal planet channel. I have liked and loved the pets especially the dog and cat.